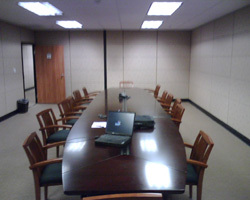 We`re proud to offer this convenient TO&A conference suite in Riverside, close to freeways such as 91, 15 and 215. Providing a professional and functional environment, this center features a beautiful office lobby, and fully furnished conference/deposition suites and many other amenities, these executive suites are perfect for the busy law firm. Our friendly and professional staff is on hand to handle all your needs. TO&A can provide all your deposition needs from court reporters, interpreting, and videography.